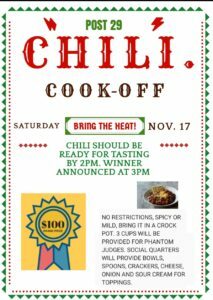 Chili Cook-off – Horace Orr Post 29, Inc.
We will have a Chili Cook-off in the Social Quarters on Saturday November 17th at 2PM. Bring a pot of your best chili and we’ll provide samples to three “phantom” judges. Best chili wins a prize, but everyone wins from a good hearty meal and camaraderie.